I have been working for years on one of the most exciting medical breakthroughs of our time – the secret of the telomere. I’ve already shared this pioneering secret with hundreds of patients at my wellness clinic. And the effect had been literally life-changing. But over the past year, I’ve uncovered new research that has inspired me to make this formula even better. The new formula I’m talking about is a completely natural energy and anti-aging booster. In fact, the key is already stored in your genes. All you need are the right triggers to activate it. This is the big breakthrough I’m talking about – a breakthrough that was previously thought impossible. For centuries, society was divided into young and old. You were either in one camp or the other. When you’re young, you have physical power and stamina… but no experience, maturity or money. When you’re over 50, you have the money and experience – but your body is falling apart. And it’s hard to enjoy the fruits of your life-long labor when these new handicaps are piling up. I can tell you now that it doesn’t have to be that way. All the physical power and potency you can handle… effortlessly married to the insight, wisdom and financial means you’ve earned over your lifetime. This latest in anti-aging technology that I pioneered – and have proven its benefits among select patients at my clinic – helps support and maintain your telomeres. By supporting and maintaining your telomeres, you can slow down your body’s aging-clock and stay years ahead of your peers. I was the first physician in the United States licensed to administer the first prototypes of this technology. I’ve been using this therapy on myself and my patients for more than five years now, and I know it works. That’s why my own energy and stamina are through the roof. I can document from my own blood tests that the length of my telomeres look as though they belong to someone in their 30s, rather than someone pushing 60! I call my new formula Telo-Essence II. Slow down aging, while restoring the strength, energy and endurance of your youth by maintaining the health of your telomeres. This is a brand-new category of biomedical technology. And a brand-new category of nutritional supplementation. And my new formula is even more powerful, more concentrated, with even more antioxidant power and telomere support. I added the “youth mineral” that flips the telomerase switch, the enzyme that rebuilds the telomere. I’m 58-years old, but I haven’t slowed down. My lab tests show I have the pulmonary age of a 25-year old. That means I have the lung power of someone half my age. My cardiovascular age is 35. My immune system is getting younger… and I feel like I am in better shape than at any time in my life… even when I was in my 20s. I have now literally lost all fear of growing old, and I wake up every day with the excitement and optimism of a kid who has just started summer vacation! It took two years of research to put together my first product, which contained 16 telomere-supporting nutrients. My new, third-generation formula is a powder, not a capsule. That means I am able to INCREASE the dose you’re getting of several key telomere supporters, including my proprietary amino hTERT complex that helps support telomerase, the enzyme that rebuilds your telomeres. The cost of my new Telo-Essence II formula is $349, but as a VIP Auto-Delivery member, you’ll receive a special discount at a savings of 45%, and pay just $199.00 with free shipping for life. And remember, as always, you have my unconditional assurance that if for any reason you are unsatisfied at any time, you can return the unused portion of Telo-Essence II for a full and prompt refund. That way, you risk nothing. 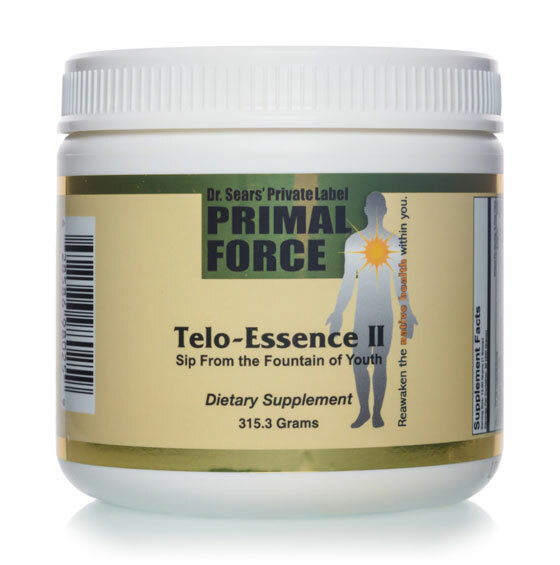 Telo-Essence II is the most advanced telomere-supporting supplement that’s ever been created, and has elements that are 500 times more powerful than the previous generation. Try it today and join me in the Fountain of Youth. I have been taking Telo-Essence II also formerly Ultra Essence since you released them. In addition, I have been doing PACE faithfully for the last 3 years. I am 57 and feel stronger than I was at 37. I used to get injuries from sports and strenuous exercise and no longer (knock on wood) feel excessively sore and stiff as in previous years. I applaud your work and am a huge supporter of your longevity Primal Force products. Thank you and keep up the great work. I am glad to be able to tell you that despite being 72 ½ years old, I maintain my endurance and ability to do the physical work that I did on the family farm when I was a teenager. I attribute this to using Telo-Essence II as well as good genes inherited from my parents. I am 74 years old and I felt just like I was 74 years old. Tired and slowed down from the rest of my life. Well I started to take this Telo-Essence II and I feel like I have lost quite a few years. I have the “get up and go” I used to have. I liked the previous formula and find Telo Essence even better. I am newly retired and doing a major renovation on a house and garden, requiring hard physical work and dealing with contractors. Eight months ago I had a knee replacement and recovered very quickly. 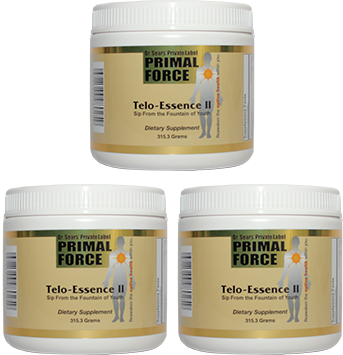 I feel young and strong, fit and able, and attribute much of this to Telo-Essence II. Prior to taking it, I felt my physical and mental abilities were slipping. 1 Jeanclos E, et al, “Shortened telomere length in white blood cells…,” Diabetes. 1998; 47(3): 482-486. 2 Wong LSM, et al, “Telomere biology…,” Eur J Heart… 2008; 10(11):1049-1056. 3 Christensen, Kaare, et al, “Perceived age as clinically useful biomarker of ageing: cohort study,” BMJ. 2009; 339:b5262. BEST DEAL: Become a Telo-Essence II VIP! I’ll save 45% by joining the VIP Auto Delivery Program – which includes FREE Shipping! I’ll get 1 jar of Telo-Essence II shipped right to my door every month for just $199. And I will get FREE shipping for as long as I take Telo-Essence II. That’s a total savings of over $1,800 a year! Order your 3-month supply of Telo-Essence II for just $299 per jar, a savings of 15%, plus shipping! That’s a total savings of $150! I’ll get 1 jar of Telo-Essence II for $349 plus shipping and handling.